This bushy, lolly pop shaped Weeping Willow tree has a number of wonderful features and eventually becomes graceful and mound-forming as it ages. Salix purpurea 'Pendula' produces silvery white catkins in the spring before maroon coloured new narrow foliage that eventually develops to green-blue. 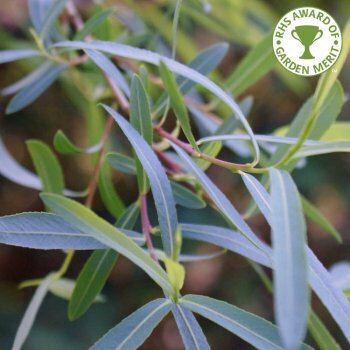 Young pendulous branches are grey and smooth often with a purple tinge. Happiest in a damp spot in the sun, this Purple Weeping Willow looks most at home next to water. Expect a height and spread of 3.5 x 2.5 metres in 20 years from this relatively compact variety of Weeping Willow with the RHS Award of Garden Merit. Our pot grown Purple Weeping Willow trees can be planted at any time of the year. Start by removing weeds and grass within a metre of your desired planting hole. Dig a square hole as deep as your root mass and approximately 2x as wide. To help the tree establish more effectively, sprinkle root grow in the hole. Allow young Purple Weeping Willow trees to grow unpruned for the first year. This will give it the time it needs to develop a natural shape. From then on you can prune damaged, or diseased branches at any time of the year. To encourage a clear stem, prune the lower branches in winter.